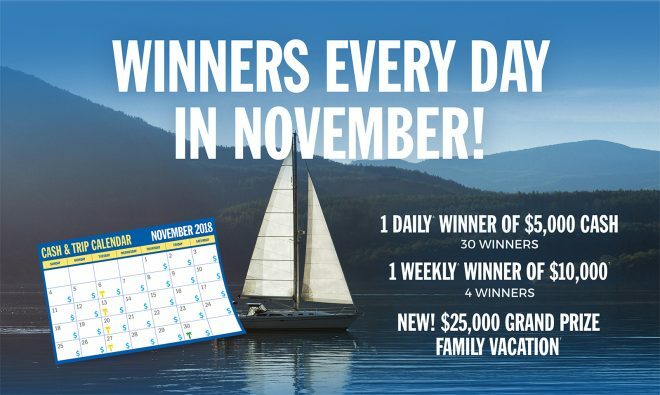 Win Cash Every Day in November! Published on August 22, 2018 at 7:33 pm . Ontario, August 23, 2018 — The SickKids Special VIP Edition Lottery has now sold out but there are still limited tickets available for the Cash & Trip Calendar – get yours before they’re gone. Win Every Day in November! There are daily cash prizes of $5,000, weekly travel prizes of $10,000 and a new $25,000 Grand Prize family vacation. Tickets start at $20, but our best pricing is 50 tickets for $100 – that’s only $2 a ticket! Your Support Makes a Difference. When you order a ticket, you help kids like Eliza, who was diagnosed with Acute Lymphoblastic Leukemia in 2016. Watch her story. ◊ * ǂ See Rules and Regulations for details. 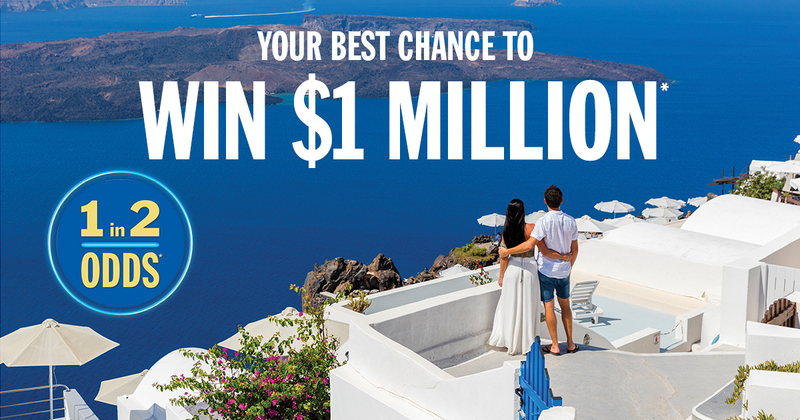 Your Best Chance to Win $1 Million is Almost Gone! Published on July 31, 2018 at 9:00 pm . Ontario, August 1, 2018 — Hurry! Tickets are Already Over 98% Sold. The SickKids Special VIP Edition Lottery is heading for a sellout and we don’t want you to miss out. There are over 38,000 prizes to be won including cash, cars and travel. Order today for amazing 1 in 2 odds and your best chance to win $1 million*. Win Every Day in November! Order your Cash & Trip Calendar tickets and start dreaming. For as little as $2.00 a ticket, you can be entered for a month of winning. There are daily cash prizes, weekly travel prizes and a new $25,000 grand prize family vacation. Also Play the 50/50 Draw. When you order your SickKids Lottery tickets, be sure to add tickets for the 50/50 Draw. The jackpot is now over $915,000 and you could win half. Help Fund the Fight at SickKids. By purchasing a SickKids Lottery ticket, you’re helping kids like Eliza, who was diagnosed with Acute Lymphoblastic Leukemia in 2016. Watch her story. ◊ * ǂ See Rules and Regulations for details. ǂ Approximate value including all taxes and freight. Prizes may not be exactly as shown. 50/50 Draw ticket must be purchased in conjunction with the SickKids Lottery. Published on July 19, 2018 at 9:00 pm . Ontario, July 20, 2018 — The Super Early Bonus Deadline is Midnight Tonight! Order your tickets before the clock strikes midnight and you could win a 2018 BMW X1 xDrive28i or BMW 230i Coupe. Choose your favourite BMW or take $40,000 cash◊. Tickets are Already Over 90% Sold. Tickets are almost gone in the Special VIP Edition SickKids Lottery. There are over 38,000 cash, car and travel prizes to be won. With amazing 1 in 2 odds and your best chance to win $1 million*, they won’t last much longer. Also Play the 50/50 Draw and Cash & Trip Calendar. When you order your SickKids Lottery tickets, be sure to add tickets for the 50/50 Draw and the Cash & Trip Calendar. The 50/50 jackpot is over $850,000 and growing daily – winner takes half. Published on July 17, 2018 at 8:00 pm . Ontario, July 18, 2018 — The Super Early Bonus Deadline is Only 2 Days Away! Order your tickets before the deadline and you could win a 2018 BMW X1 xDrive28i or BMW 230i Coupe. Choose your favourite BMW or take $40,000 cash◊. Tickets are Already Over 85% Sold. It is no surprise tickets are getting snapped up in the Special VIP Edition SickKids Lottery. There are over 38,000 cash, car and travel prizes to be won. With amazing 1 in 2 odds and your best chance to win $1 million*, tickets won’t last much longer. Also Play the 50/50 Draw and Cash & Trip Calendar. When you order your SickKids Lottery tickets, be sure to add tickets for the 50/50 Draw and the Cash & Trip Calendar. The 50/50 jackpot is already over $800,000 and growing daily – winner takes half. The SickKids Lottery is Back! Published on July 4, 2018 at 9:00 pm . Ontario, July 5, 2018. As a subscriber to Home Lottery News, you are part of a select group receiving information about the Special VIP Edition SickKids Lottery. There are over 38,000 cash, car and travel prizes to be won. With amazing 1 in 2 odds and your best chance to win $1 million*, tickets aren’t expected to last long. The Super Early Bonus deadline is July 20. 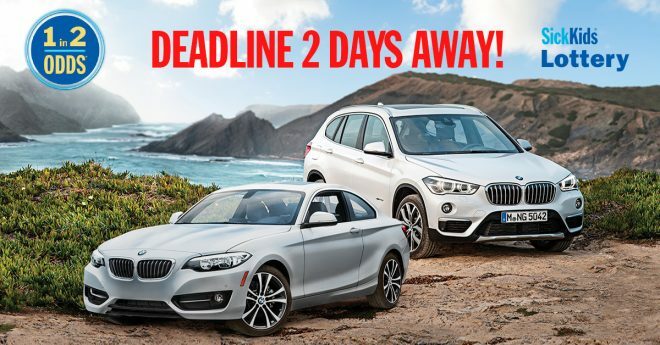 Order your ticket by the deadline and you could win a 2018 BMW X1 xDrive28i or BMW 230i Coupe. You can choose your favourite BMW or take $40,000 cash◊. Also play the 50/50 Draw and Cash & Trip Calendar. When you order your SickKids Lottery tickets, be sure to add tickets for the 50/50 Draw and the Cash & Trip Calendar. The 50/50 jackpot is already over $675,000 and growing daily – winner takes half.